Each year Storage Asset Management, Inc (SAM) announces the results of their managed self-storage properties compared to the 5 publicly traded self storage companies, REITS (real estate investment trusts), of CubeSmart, Extra Space Storage, Life Storage, Public Storage, and National Storage Affiliates Trust. For the full year of 2017, SAM increased same store revenue by 6.3% and net operating income by 10.2%. Occupancy at SAM same store locations held strong, ending the year at 89.9%. 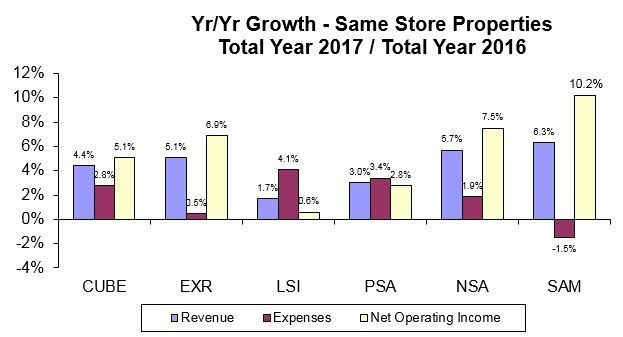 SAM outperformed all five of the public REIT’s in all three of these categories, as well as decreasing expenses at SAM stores by 1.5%. The five REITs release their “Same Store” operating results to their investors and the public. “Same Store” results measure growth at “mature” stores, in which each company already own/managed. Some companies exhibit growth in revenue by opening new stores, therefore, the same-store sales information points out the difference and measures only growth within a company. An increase in same-store sales, from mature properties only (stores that are no longer in lease up), may indicate that existing customers are spending more with the company or demand is increasing bringing up the occupancy of the stores. To add to SAM’s remarkable year, the managed stores under SAM collected over $39 million in revenue and moved in over 22,500 tenants, including 874 complete online rentals. In 2017, SAM managed over 5.7 million square footage, which is a 61% increase from 2016. including 42,470 storage units. At the end of 2017, SAM managed 93 stores operating under 51 brands, including SAM’s created brand of Storage Sense. Additionally, SAM’s managed stores collected 1,502 reviews with an average of 4.6-star rating. Storage Asset Management continued to be a leading player in the self-storage industry. In 2017, SAM was named the largest privately owned self-storage management company, and ranked number 5 overall behind the REITs in number of managed self-storage facilities. SAM was also selected Inside Self Storage’s Best Operating Consulting company in the ISS Best of Business awards. SAM ended 2017 with 210 employees, a 70% increase from 2016. SAM holds themselves to very high standards and expectations. SAM attributes the outstanding 2017 to a strong team of Store Managers and Assistant Managers; District Managers’ ability to focus and train; company-wide focus on training; customized marketing and operating plans for each location; industry leading online/digital marketing strategies; and an ability to build solid local business to business relationships in each market we serve. SAM also maintains strong relationships with their managed storage facilities’ owners and other self-storage industry leaders. In 2018, Storage Asset Management is excited for another outstanding year. Since January 1, SAM has been awarded seven new management contracts of operating stores, and over ten contracts for storage facilities in development. The 5 Key Steps to Increasing Sales Conversions Today!